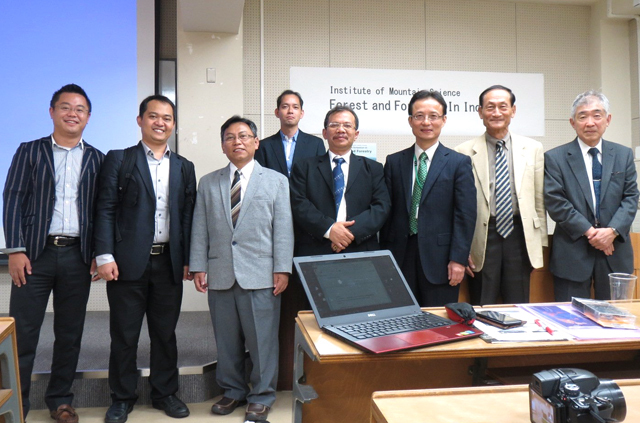 On the 7th October 2014, the Institute of Mountain Science held an international symposium entitled “Forest and Forestry in Indonesia” at the Minamiminowa Campus, jointly with Bogor Agricultural University (IPB) with whom concluded an inter-university agreement in March this year. Indonesia is an island nation having a national land whose width is about the same as that of North America. However due to insufficient supervision, every year uncontrollable large scale forest fires occur that cause smoke damage to neighboring countries, so measures to quickly detect them and extinguish them is an international issue. Ministry of Forestry wishes to use artificial satellites for early detection of forest fires, leading to measures to extinguish them, and is carrying out international scientific and technical cooperation with Professor Masato Kato, Head of the Institute of Mountain Science who is a specialist in this field. Dr. Jaya and Dr. Tiryana were invited from the Faculty of Forestry of Bogor Agricultural University, and from within Japan Dr. Hara, Representative Director of Visiontech Inc., who is also a member of Science and Technology Research Partnership for Sustainable Development(SATREPS), and Dr. Nobuyuki Abe of Niigata University were invited, to discuss Japan’s international contribution, the development of global human resources which is the basis of SATREP, in the context of forestry and timber business in global scale, such as problems of virgin tropical forests in Borneo and Sumatra, forest fires, etc. On the 8th of October the visitors toured Kamikochi station of the Institute of Mountain Science. On 9th October 2 hour lecture was held regarding the present status and problems of remote sensing of forests in Indonesia, during which lively questions and answers were shared with students regarding the problems in Indonesia such as mechanisms for determining illegal logging, why it is not possible to reduce forest fires, etc.